Ask a teacher to teach the same short story to children every day for eight or more years, and they will likely look at you like you are crazy! Yet, in a sense, that is the challenge of teaching tefillah. We have the same tefillot, more or less, that we use with our children day after day for their entire school career. Unless there is a conscious effort to create a rich tefillah experience, group prayer is at risk of becoming a mindless task, with children (and adults!) on autopilot. In truth, “autopilot tefillah” can appear good in elementary services because of the natural love of young children to sing. Tefillah expert, Saul Wachs, calls this “the Trap” of elementary tefillah (Wachs, 2009). This is because autopilot elementary tefillah leaves nothing in place when children get older and singing does not have any appeal. 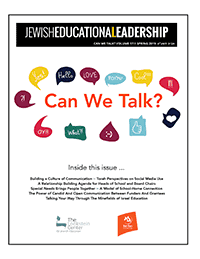 It is critical that elementary children form a relationship to tefillah so that by the time they get to middle school, they understand it and value it. What do the words mean to me? The first question we address when we teach children to pronounce the words of the tefillah properly, to utilize nusach appropriately, and to be knowledgeable of the choreography of the service (eg. when to stand). The other two questions are often neglected in the elementary tefillah service. When we address the second question, we are teaching children to identify key lines and important vocabulary in the tefillot. We are also teaching them to identify the big idea of each prayer. The third question is even more complex because it asks us to foster a relationship with the tefillah. We need to have children create personal meaning of the various prayers that they read. The arts are a key avenue for developing this relationship because personal meaning emerges from personal engagement with a text. The arts invite that engagement. Through soul stirring music, through story telling, through movement and through the visual arts, doors into the prayers are opened and children are invited in. Let us examine these four doors in depth. In the following sections I will share successes I have had using the arts in teaching tefillah to elementary students at Associated Hebrew Schools in Toronto. Mix up the music: Elementary children love to sing, so it is a mistake not to make the most out of this avenue into the elementary child’s spirit. Take a look at the tunes being used for tefillah—are they the same as last year’s and the year before that? A great way to breathe new life into any elementary tefillah service is to change up the tunes. Search through YouTube, talk to the musical leaders from synagogue and camp, and talk with children. Do not be afraid to adopt an inspiring tune to new words. But, choose tunes that your kids will like as well as you. Look for jazzy beats and music that speaks to kids. If you can bring musical accompaniment to tefillah, it will add an incredible dimension. One cautionary note: more is not necessarily better when it comes to introducing new tunes. I find that I can introduce two or three new tunes each year. I teach the tunes slowly, with children mastering one part at a time. I make sure that I connect the teaching of the song to overall learning about the tefillah. By moving slowly, children develop a relationship to the specific prayer they are learning. One underutilized musical tradition is niggunim. Niggunim are wordless tunes that are chanted communally. They are from the Chassidic tradition and can be an incredibly powerful tool. Because niggunim are wordless, anyone can participate—even teachers who are nervous around Hebrew or who may even be non-Jewish. The chanting of a niggun can build the energy in a room and transform individuals into a community. A relative to the niggun, and an excellent accompaniment to the niggun, is communal drumming. Teach children to drum along on their laps, at tables, or on the floor. You can build unity by having children all drum the same patterns, or you can encourage individualism within the community by having them improvise their own patterns while maintaining a common beat. After a drumming tefillah, I can often observe children drumming all day long. Tell a story: Good story telling opens the minds of children to discussing difficult issues without it getting personal. It is much easier, for example, for a child to talk about a character in a story that should do teshuva, repentance, than for that child to share a time when he or she did a wrong that required teshuva. Of course, you need to choose stories with some meat to them—ones that require children to struggle with an issue and that connect to your learning objective for the prayer. Your sources for stories span the history of the Jewish people. I have used stories that range from the Tanach to rabbinic writings in the Talmud and Midrash to folktales to modern writing. There are two keys to increasing engagement during story telling, especially with a large group. The first is to tell the story in a dramatic way. Regulate your volume to capture the mood of the story. Use voices for the characters that speak. Pause at dramatic moments. All of these techniques develop over time but practicing the story before telling it is an important way to prepare for good story telling. Also, inviting a “guest” to be the story teller can be a great way to engage teachers who are required to be at tefillah but often feel like their sole role is to police. The second key to increasing engagement during story telling is to give children a task prior to beginning. For example, ask children a question that directs their focus to your objective for the lesson. This is the question that you will start your post-story discussion with. If tefillah occurs in a classroom with children at desks, you can have children actually write their answers as you are telling the story, or they can fill in a graphic organizer. If tefillah occurs in a large group such as in a synagogue, consider having children do something once they have an answer. I often tell children to put their hands together once they have discovered the answer to my question. Setting a task for children during story telling helps prevent most kids from zoning out during tefillah. Movin’ Movin’: When you get kids moving, you are guaranteeing engagement. Dance and dramatic movement can be powerful ways of connecting children to tefillah. In this section, I would like to focus on one particular technique that I have found extremely powerful for engaging daveners of all ages. I call the technique the “human opinion graph”. The idea is to pose a question and have children physically move to give an answer. One could argue that human opinion graphs are not really art. However, because human opinion graphs are a visual expression of the beliefs of the participants, I feel their inclusion here is appropriate. Sit/Stand: This is a good technique for doing a quick survey. You ask a yes/no question like: do you believe God has a role in our day to day lives. If yes, please stand. If not, stay seated. Human Bar Graph: Similar to Corners, in the Human Bar Graph, you set the chairs up in a row at the front each with a response. You ask a question and the children have to sit in a straight row behind the chair that matches their response. Values Continuum: The idea here is for the leader to make a statement that children can strongly agree with, strongly disagree with or be somewhere in the middle. An example of a statement might be: God is the source of all bad things in the world (I use this to introduce the blessing yotzer or). Children who strongly agree move to one end of the room, and those who strongly disagree move to the other end. Most children place themselves somewhere in the middle. Visual Arts: There are ideas which are simply not captured through words. For this reason, artists throughout the years have attempted to express the meaning of tefillot through drawings, paintings, photography and other forms. At our tefillah, we can invite children to express their ideas about key lines in various prayers through the visual arts. For example, when we studied the kedushah, I told the children the story from Isaiah 6 where the angels are calling to each other. But, what did this scene look like? What do angels look like? I challenged children to create pastel drawings of the line “kadosh, kadosh, kadosh”. In this case, my first step was to show children a wide variety of artistic depictions of this scene. I did this to open their minds to the idea that angels are not necessarily chubby, little boys with wings. The creations of the children were creative and imaginative. We hung the angel pictures in our makom tefillah and one angel image became the centre of the parochet our fifth graders were making as their “moving on” project. Eager to try some of these ideas in your next tefillah gathering? Great! But, before you do, examine your school’s culture of tefillah. Using any of these may require a shift in the adult understanding of children’s prayer at school. It is important not to underestimate the attachment teachers, administrators, parents and even children have to the way tefillah is done. In particular, many people have strong feelings about how much praying should be “sacrificed” for learning about tefillah. A good way of thinking about this issue is as a tension between kevah and kavanah. Kevah are those parts of the prayer experience which are defined and unchanging. Kevah focused tefillah is filled largely with the recitation of prayers from the siddur. Kavanah is the part of the prayer experience where daveners are engaged in understanding and relating to prayer. There is no way to introduce arts-based learning to your tefillah without sacrificing kevah for kavanah. If this is an issue at your school, I strongly suggest having this discussion with your stakeholders before you shift the kevah—kavanah balance. You can introduce this idea of kevah and kavanah and you can even do a “values continuum” activity with them—although adults tend to prefer to do this on paper rather than with movement. In the end, you should come away with an idea of how much time should be spent on kevah and how much time on kavanah. At my school, I spend a third to half of tefillah on building an understanding of and a relationship with the text. While this may seem like a lot, in a thirty minute time slot which includes getting settled at the beginning, I am left with ten to fifteen minutes. However, with good planning, and by breaking activities into smaller chunks, it is possible to do great things in this time. Through engaging our children in their tefillah, we inspire your children to be great daveners because they have a personal relationship with their prayers. And, we set the groundwork for the successful continuation of tefillah in middle school, and for the rest of our children’s lives. Truly holy work. Wachs, Saul P. (2009). Towards a theory of practice. New York (NY): The Solomon Schechter Day School Association.